Definition at line 38 of file ContinuationIndenter.h. Definition at line 183 of file ContinuationIndenter.cpp. References DelimiterStyle, EnclosingFunctionStyle, clang::format::getLLVMStyle(), and clang::format::getPredefinedStyle(). Definition at line 208 of file ContinuationIndenter.cpp. Definition at line 216 of file ContinuationIndenter.cpp. Definition at line 39 of file ContinuationIndenter.h. Referenced by getDelimiterStyle(), and RawStringFormatStyleManager(). Definition at line 40 of file ContinuationIndenter.h. 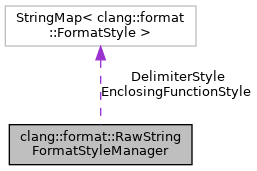 Referenced by getEnclosingFunctionStyle(), and RawStringFormatStyleManager().